You need to have a clear message, structure and content in your PowerPoint before you import to Prezi. If you have that, let’s get started! The purpose of this post is to show you how to easily create good visual style and good structure in your Prezi. So don’t pick a Prezi template when you start. Ignore all the templates and click on “blank”. The whole point of this post is that too many people are using the same Prezi standard layouts when they import their PowerPoints. Its not that they are bad, but chances are you are using Prezi instead of PowerPoint because you want to be original. And too many people have already used all those layouts. Using the “insert” button, choose “PowerPoint” and locate your file. Now you can see all your slides, you can apply some simple structure. Move your slides around on the canvas so that slide that go together are together – do this by dragging the frame around. Be careful not to change the size yet! Repeat per section until you have something like this – starting to look good ! 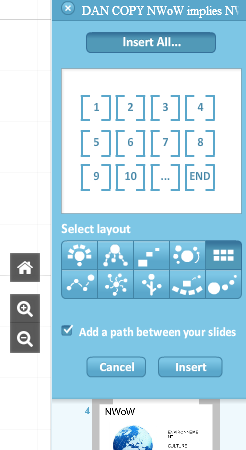 Step 6: Add your new section/category frames to the pathway and put them in the “right” place. Move the new frames to their correct position in the pathway. For example, if your first section/category is called “A” and consists of slides 1, 2, 3 put your “A” frame in front of 1, 2, 3. And if section/category “B” consists of slides 4, 5, 6, put your “B” frame after “3” and before 4, 5, 6…. Find a font that has some holes in it – in a minute, we are going to place our “slides” inside those holes…. There is a lot more you COULD do to improve this Prezi – I added some fade-in effects and a little more pathway movement. And because my Prezi is for a long conference, I put the “presentation title” text in-between each section/category as a transition to remind us of the general point from time-to-time. But I promised 10 steps and 20 minutes, so that’s it for now. Several years ago, my wife’s company invited its employees and family to “Roi Baudouin Stadium” in Brussels to see Johnny Hallyday in concert. Now, I’m not going to mention his name again, or (dare I say it in Belgium) mention how terrible that entire experience was for me. But I would like to say something about his support act, Yannick Noah. Noah was a tennis player first, but now makes music. Opening for Johnny, he was wild. Hs music was full of energy and so was he. And then it happened: With his cordless microphone in hand, he jumped off the stage and ran into the crowd of 60,000 people, running around singing IN the crowd. I’ve never seen anything like it. 60,000 people and he still jumped in. It was awesome! Now, I don’t think this was a pre-thought strategic move from him. i think he did this out of pure excitement. It not as if he was greeting his fans – they were there for Johnny (or because they were Belgian, or out of some kind of “wifely work obligation”). But what he did was brilliant and a good lesson for any presenter: Get in there. Be with your audience. It breaks boundaries, creates dynamism and connects you to the people you are talking to. If you are presenting to a large audience (a big room, say 200 people) use whatever you can from the room layout to add dynamic movement to your presentation. If you can walk up an aisle to get closer to someone who asked a question, do it. Don’t forget that movement goes up and down as well as left and right and back and forth. I like very much to squat down or perch on the edge of a table when listening to a long comment or group discussion during a presentation in a small room. I’m trying to send the message that its not about me anymore, so I get a bit more out of the way. Meet people at the door. I’m sure if Yannick Noah could have shaken hands with the 60,000, he would have. The last time I spoke at a conference as part of Epsilon2012, I shook hands with every one of the 200-odd people coming into the room, looked them in the eye and thanked them for coming. Get in contact with your audience! Almost every presentation you never see is either exactly the same as the last one, or a minor upgrade in terms of performance. Try these tips to make a mark on your audience and really connect. 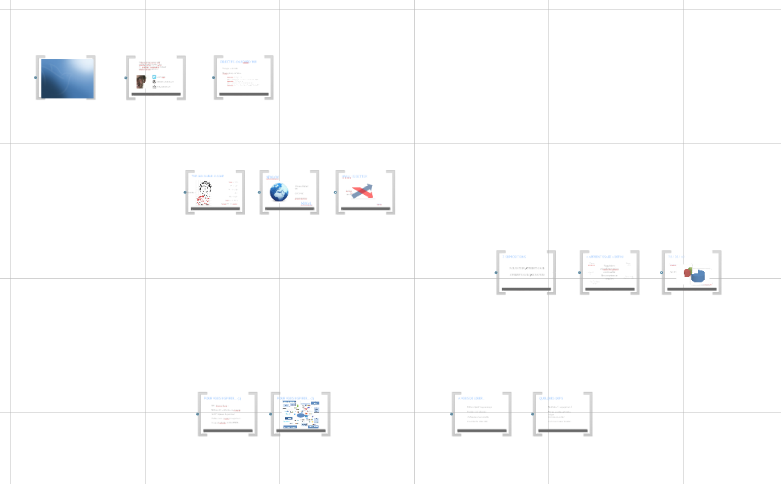 Prezi is a great tool full of functions, but if you don’t follow good structure guidelines it can all go terribly wrong…. I admit it sounds harsh to say people should be shot, but actually it’s an acronym for what should be done to most Prezi users: They should be Stopped, Helped or Trained. Why? Read on..
As people start adopting Prezi, many of them forget 2 of the 4 pillars of an effective presentation: Message and structure. What do most people do with Prezi? They see a big wonderful canvas that goes in and out and left and right and up and down and they just start doing EVERYTHING. As a result, I am seeing Prezi presentations that swing in and out and left and right, using random animation effects and terrible pictures that for some reason are rotated 37 degrees to the left. This must stop. In this post, I’ll explain how to apply the fundamental presentation concept of message + structure to a Prezi presentation. If you do what I say, people will be able to follow your Prezi presentation (without sea-sickness) and your main message and its delivery will be reinforced by excellent structure. Prezi is a 3D canvas (surprise!) consisting of height, width and depth. 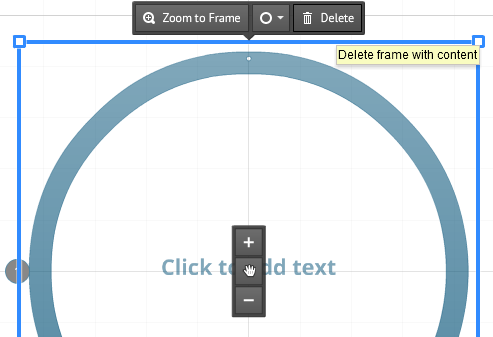 Now let’s talk dimensions… You can move left/right, up/down and in /out in Prezi. Which one’s work best for which reasons? If you want to avoid sea-sickness and reinforce the natural (diamond) structure of your presentation, then height and width are used to move BETWEEN structural parts of your Prezi and depth is used to add detail WITHIN one part. ..and finally, what should you do with the possibility of spinning and BIG movement in Prezi? When should you use a big spin, rather than something moving gently left/right or up/down? Its easy: The bigger the movement, the more the audience will feel like there is a big change happening. So restrict your big spins and large in/out movements to major structural transitions. In this way, you can reinforce your structure just like Dora-the-Explorer would. For movement between sub-points at the same structural level of detail, make your movements gentle left/right or up/down. (A little rotation is OK, but don’t go overboard). If you apply all these simple ideas, your Prezi will make global structural sense and people will be able to follow. Of course, these are only guidelines and you can make exceptions for effect wherever you like. 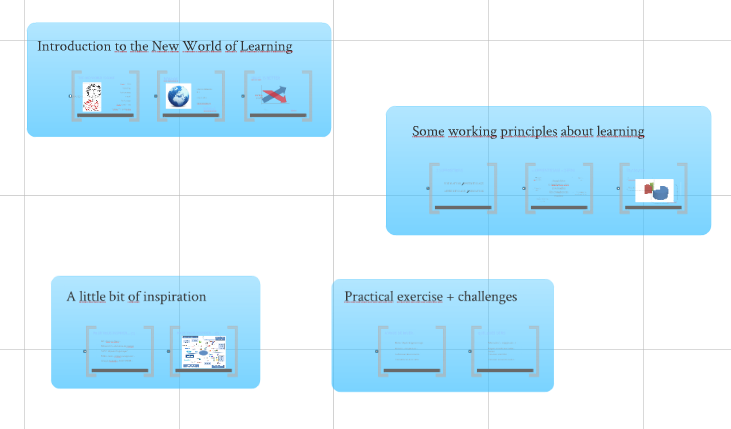 To see it all in action, have a look at my conference Prezi on how “How to Improve Formal Learning with Social Media “. Another 7 Best Prezi Tips. Please share, follow me on Twitter, leave a comment., follow the blog..
..or join me in Prezi training. Your presentation structure will help keep attention, creating better understanding and recall of your message. This post outlines the fundaments of good presentation structure. There are many different types of presentation structure and I will outline the possibilities in a future blog-spot. Today, I will show you the most classical structure, which I believe is relevant for most business presentations: The diamond structure. The diamond structure is based on the “Pyramid Principle” from Barbara Minto – you can get more information here or buy the book on Amazon. For a visual representation of the diamond structure looks like, follow this link. Minto explains that this can leave the audience confused as they listen and search for the links between details, trying to understand “What is the point?” This will encourage them to switch off (and sleep) and they will be less likely to remember what you told them. * note: look carefully at how I applied the “message before details” principle at each level of the structure. If you are using PPT, this same principle should be applied to each slide, meaning that the titles of your slides will give the key message for that slide, before you give the details. What is the natural order of things ? What must I tell first in order that what follows is best understood? How will I link 1 part of my presentation to another? Looking at any random part of my presentation, how does this follow on from what came before and lead to what is next? If you have comments, add them! Trainees sometimes ask me: “What is the most efficient way to make a presentation?” Follow these 5 steps and you will know the answer… Objective, Audience, Message, Structure, Content ! The pages linked above outline what to do at each step – follow the links and follow the instructions and you will be able to make a great presentation. …and even if you prefer other ways to make your presentation, you will still need to deal with 5 basic steps. I can tell you now that the most efficient way is not opening PPT and just getting started on your visual support! Design your presentation first! If you have comments, add them.